The new 911 Turbo has been spotted with the roof down for the first time. It’s been a while since we had a new sighting of the new Porsche 911 Turbo as the automaker prepares to unleash the new 992 generation of the iconic sports car. As the summer ends, a test driver has been caught taking advantage of the fleeting sunshine, giving us our first look at the next-generation Porsche 911 Turbo Cabriolet with the top down. This isn’t the first time we’ve seen a glimpse of the 911 Turbo Cabriolet, however, as a prototype of the convertible sports car was spotted getting a workout at the Nurburgring back in June showing off its soft top roof. Porsche has tried to disguise sections of the front fascia, but it otherwise looks production ready. Compared to the standard 911, the new Turbo sports wider fenders giving it a more muscular appearance and a large rear spoiler. Sources suggest the next-generation 911 Turbo will be powered by a twin-turbo flat-six with an output of around 600 horsepower. Don’t forget the current 911 Turbo S packs 580 hp, so it isn’t unreasonable to expect the all-new model to deliver at least 600 hp. 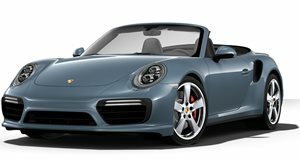 Power will be sent to all four wheels through the latest version of Porsche’s seven-speed PDK dual-clutch transmission. The 992-generation Porsche 911 Carrera, which has already been spied undisguised multiple times, will likely be unveiled in November at the LA Auto Show. Looking back at Porsche’s model history, the Turbo version typically debuts a year after the Carrera, so we’re not expecting the new 911 Turbo to arrive until later next year, possibly at the 2019 Frankfurt Motor Show.